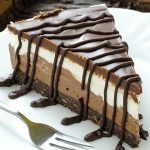 No Bake Oreo Mint Cheesecake – try to make this Oreo Mint Cheesecake, and you will see that you have never made easiest cake that is so yummy! 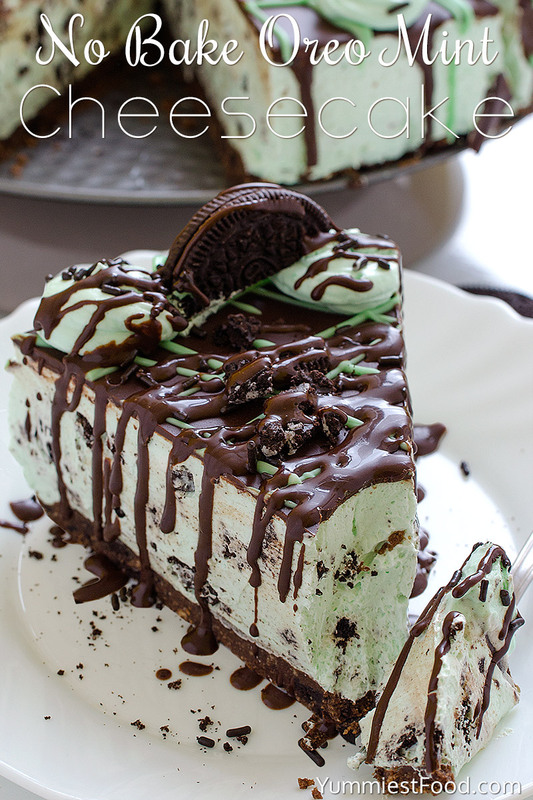 So easy to make without baking, Oreo Mint Cheesecake! How we can make good, delicious cheese cake like we eat in the restaurant? I was watching TV and I saw this beautiful cake and a perfect photo. That photo motivated me to make this so tasty cake! I wrote down recipe and started my Oreo Mint Cheesecake adventure. 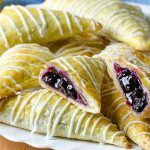 This is so easy, without baking, and believe me it will definitely succeed. Oreo lovers, must try this sweet, creamy, surprise and it is so easy to make that your children cake help you to make it! 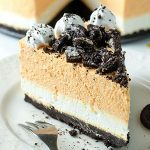 I guess that you like to make sweet things for your family and friends, but when it is so easy like my No Bake Oreo Cheesecake, believe me, you will like it the most! So delicious cake in a short time. In my family this Oreo Cheesecake is favorite. I make this Oreo Mint Cheesecake and my family eat it immediately. 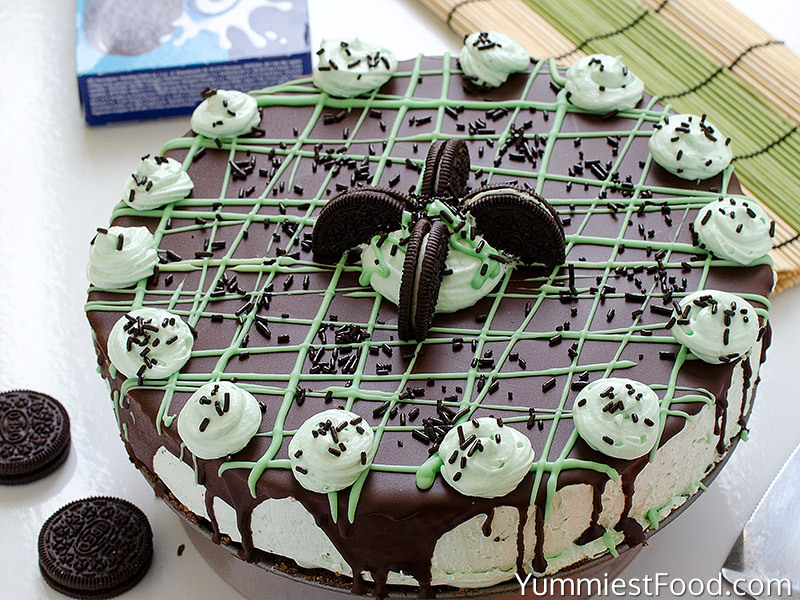 When I finish Oreo Mint Cheesecake I try to decorate it, but my children can’t wait to eat! This dessert I make in my kitchen very often. In the beginning I was making it only for my family, but anyone else who has tasted this cake asked for recipe. I got many compliments, and everyone thought that it was difficult to make. I think I never made easiest cake. Today, my Oreo Cheesecake became favorite dessert of my friends and their families. 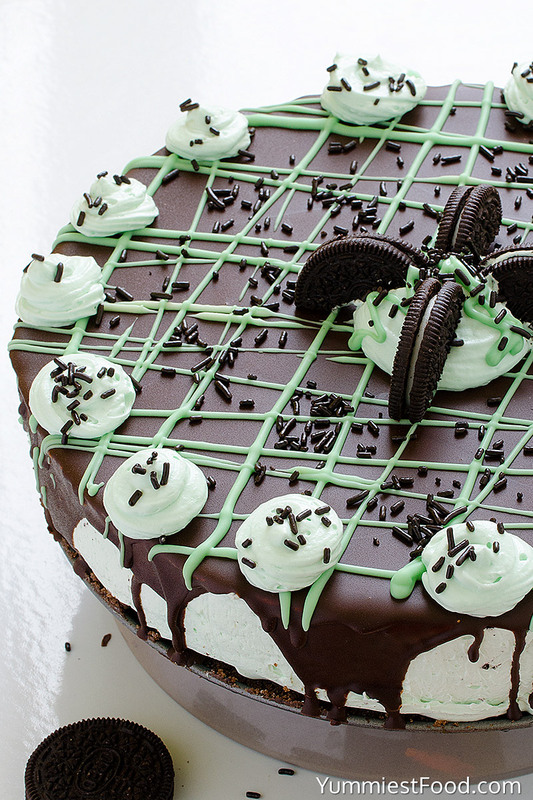 Children or adults, everyone likes this Oreo Mint Cheesecake. But maybe, we like it because it is easy and quick to make.. Who knows.. 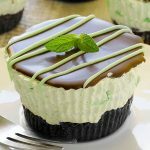 Try to make it..
No Bake Oreo Mint Cheesecake - try to make this Oreo Mint Cheesecake, and you will see that you have never made easiest cake that is so yummy! 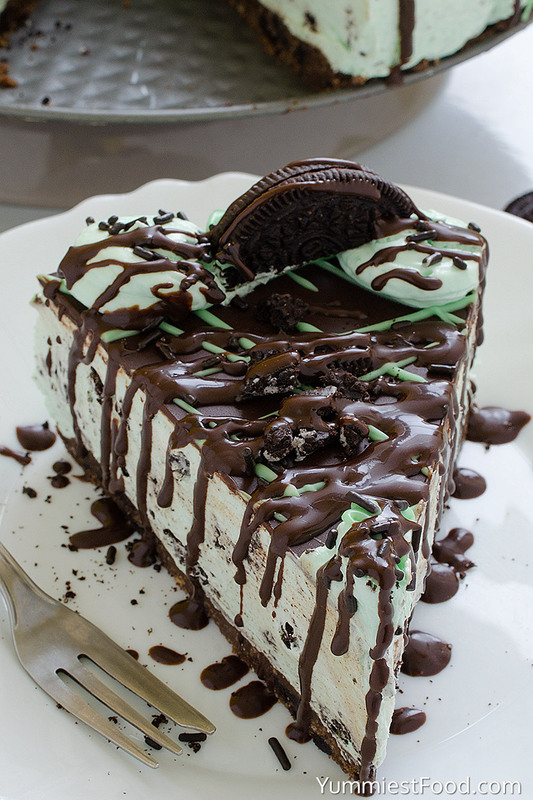 So easy to make without baking, Oreo Mint Cheesecake! In the finely crushed Oreo cakes add melted butter. Add crust mixture on the bottom of springform pan and leave it for 10-15 minutes in the fridge. In the large bowl mix cream cheese, powdered sugar, until become creamy. Add heavy whipping cream and mix until becomes thick. Add mint extract, green food color and Oreo crumbs. On the prepared crust add fill and leave the cake in the fridge for 1 hour. After an hour, melt chocolate chips in the microwave and add on the fill. What size springform pan…this one looks like a 10 in….can it be made in a 9 in? Hi Lisa, my springform pan is 9 in, too, so you can make it in 9 in pan. Enjoy! Hi Jennifer! For that decoration I melt 1 cup white chocolate chips in the microwave and add a few drops of green food color. What did you use for the little blobs (for lack of a better word) along the outside and in the middle? Hi Susanna, I have used chocolate sprinkles. Enjoy! No, she means the white “blobs” around the edge and in the center…Looks like whipped cream, maybe? How do you get the green chocolates so thin and even? How do you put them on? Hi Janice, I melt white chocolate chips and add a few drops of green food color then transfer melted chocolate to a ziplock bag, cut off the corner and drizzle over the top. Hope that helps! Hi Rose, Yes! Sorry for the confusion. Have a wonderful Christmas season! 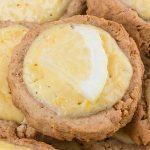 Just wondering do you remove the cream from the Oreo biscuits to use in this recipe? Hi Erin, I don’t remove the cream from the Oreo biscuits for this recipe. Enjoy! Are you able to tell me what heavy wiping cream is in Australia? Hi Naomi, it isn’t very important what kind of heavy wiping cream you use, more important is the amount of cream (2 cups). Enjoy! Do you whip the cream before you add it in or do you just pour it in from the carton? Hi Patty, you need to whip the cream. Enjoy! But do u need to whip the cream separately, first, then fold it into the cream cheese? This part is confusing to me as well. Hi Joe, you need to whip the heavy cream first and then add it in the cream cheese. Good luck! Do you whip the heavy cream first before adding it to the cream cheese or just add the two cups straight from the container? Hi Suzanne, you need to whip the heavy cream first and then add it in the cream cheese. Enjoy! Do you use the regular Oreos for this or the Mint Oreos? Hi Stephanie, for this recipe I use regular Oreos, but you can use mint Oreos too. Enjoy! Can you omit the mint extract and make it a cookies and cream cheesecake? Or will it need another flavour enhancer? Vanilla extract? Yes, you can use Vanilla extract instead of mint extract. Good luck and enjoy! What is the frosting on top? Hi Mary, you can melt chocolate chips for the frosting on the top. Enjoy! Hi Becky, I haven’t tried to make this ahead of time and freeze it. Hi Once you have melted the Choc Chips and pour onto the Cheese Cake, does the heat not cause it to seep into the Cheese Cake?? Hi Nicole, you need to let cake cool and then add chocolate glaze. Good luck and enjoy! Hi. When you say powdered sugar, does this mean icing sugar? Hi Belinda, It doesn’t mean icing sugar. 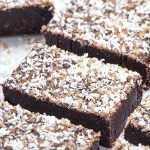 I use powdered sugar in this recipe. Good luck! Hi Belinda. Powered sugar is Icing sugar. Hi. Is this 2 cups of unwhipped cream that you whip and then add or 2 cups of whipped cream? Yes, you are right, 2 cups of unwhipped cream. Good luck and enjoy! Is it 24 oz of cream cheese or is it two 4 oz packages of cream cheese?? Hi Breanne, it is 24 oz of cream cheese. Good luck! Hi Uma, sorry for the delayed response. I’m glad that you like the recipe. I haven’t tried with fresh mint, but you can make syrup and use it instead of extract. You can make syrup very easy. In 1 cup boiled water add 1/4 cup chopped fresh mint. Good luck and enjoy! Hi. I just wondered what you use to make the blobs that go around the top of the cake. They have chocolate sprinkles on them. Is it cream or is it the cheesecake mix without the Oreo crumbs. Thanks. Hi Kathryn, for decoration I have used the cheesecake mix without the Oreo crumbs. Enjoy! Hi! What is the size of your spring form? Hi Alexia, my springform pan is 9 inch. Enjoy! What can I use as a substitute for the heavy whipping cream? 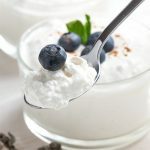 Can I use original greek yogurt? Hi Analiz, I haven’t made this recipe with Greek Yogurt myself but you could certainly try. Is the Greek Yogurt you can find the type that will thicken to stiff peaks? If so, yes, that will work! Melting chocolate chips does not create a top like what is shown. You need to add some oil,but that was not mentioned or put in the ingredients. I used a sweet german chocolate baking bar melted in the microwave, let chocolate cool a bit then pour on top and it worked perfect! I believe the culinary term would be: chocolate ganache! I just forgot to reserve filling before adding cookies for decor and I crushed my cookies too fine so my filling is no longer green! Tastes amazing! Can COOL WHIP be used as a substitute for the heavy cream? If so, how much? Hi Jim, I haven’t made this recipe with cool whip myself but you could certainly try. Is the cool whip will thicken to stiff peaks? If so, yes, that will work! After put filling in pan, can’t i put it in freezer instead of fridge for hour? Hi Jenny, I haven’t tried to freeze it, but if it looks like your cheesecake isn’t setting, or you’re even not sure, try it anyway. Can you make the cheesecake the night before? Hi Lidia, You have me confused. At one reply you say to whip the cream first but in another reply you say to add the whipping cream unwhipped. Which is it? By the way, I made your Orange Creamsicle cheesecase and it was simply devine! Hi Pat, Sorry for the confusion, you need to whip the heavy cream first and then add it in the cream cheese. 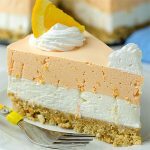 Thanks so much for trying the recipe Orange Creamsicle cheesecake. Have a wonderful Christmas season! Made this for Christmas and it was a HUGE hit! Completely gobbled in an hour of arriving to my family Christmas dinner. Thank you for sharing. You’re very welcome, Paula! 🙂 I’m glad you like the recipe! Hi Michelle, you need to whip the heavy cream first and then add it in the cream cheese and mix. Good luck!